The Master Lock Magnum<sup></sup> No. M701BLCDHC Padlock and Hasp Combo Pack features a 1-3/4in (44mm) wide Magnum<sup></sup> laminated padlock and a case-hardened steel hasp. The Master Lock No. 5SSKAD Stainless Steel Padlock features a 2inch (51mm) wide laminated stainless steel body for maximum strength, reliability, and weather resistance. The 3/8inch (10mm) diameter shackle is 1inch (25mm) long and made of stainless steel, offering maximum resistance to cutting, sawing and weather. The 4-pin cylinder prevents picking and the dual locking levers provide resistance against prying and hammering. The Lifetime Guarantee provides peace of mind from a brand you can trust. The Master Lock No. 4684T Set Your Own Combination TSA-Accepted Luggage Locks feature a 1-3/8inch (35mm) wide bright color body for simple baggage identification. The 1/8inch (3mm) diameter shackle is 3/4inch (19mm) long and made of steel, offering resistance to cutting and sawing. Transportation Security Administration (TSA) screeners can open, inspect and relock bags locked with a TSA-Accepted lock. Lock your checked baggage with the lock TSA screeners won't cut! The Limited Lifetime Warranty provides peace of mind from a brand you can trust. The Master Lock No. 5425D Wall Mount Light-Up Dial Lock Box features a 2-7/8inch (72mm) wide metal body for durability. The wall mount design offers permanent installation. The large, easy to read light-up dials, combined with resettable combination functionality, provide a secure storage location for spare keys and access cards. The Limited One Year Warranty provides peace of mind from a brand you can trust. 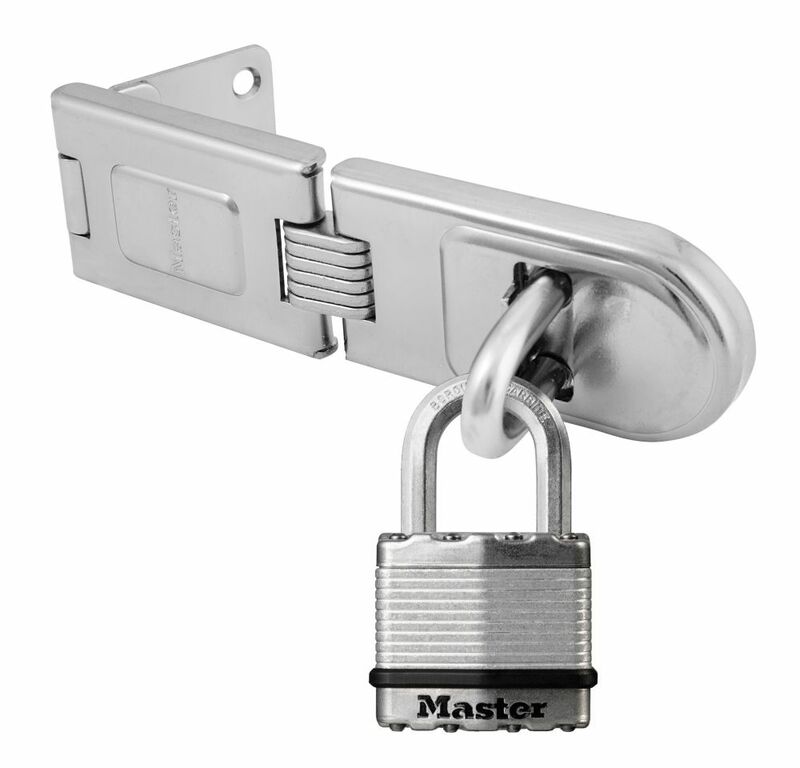 Magnum Padlock And Hasp Combo The Master Lock Magnum<sup></sup> No. M701BLCDHC Padlock and Hasp Combo Pack features a 1-3/4in (44mm) wide Magnum<sup></sup> laminated padlock and a case-hardened steel hasp.